This report presents an exploratory analysis of habitat availability and use by adult Scaphirhynchus sturgeon on the Lower Missouri River from Gavins Point Dam, South Dakota, to the junction with the Mississippi River. The analysis is based on two main data sources collected from 2005 to 2007: (1) a compilation of 153 reach-scale habitat maps (mean reach length, 2.4 kilometers) derived from boat-collected hydroacoustic data and (2) a sturgeon location dataset from which 378 sturgeon telemetry locations are associated with the maps (within 7 days of the mapping and within 10 percent of the discharge). The report focuses on: (1) longitudinal patterns of geomorphic and hydraulic characteristics revealed by the collection of reach maps; (2) assessment of environmental characteristics at sturgeon locations in the context of the mapped reaches; and (3) consideration of spatial distribution of habitat conditions that sturgeon appear to select. Longitudinal patterns of geomorphology, hydraulics, and associated habitats relate strongly to the engineered state of the river. Reaches within each of the following river sections tended to share similar geomorphic, hydrologic, and hydraulic characteristics: the Minimally Engineered section (Gavins Point Dam to Sioux City, Iowa), the Upstream Channelized section (Sioux City, Iowa, to the junction with the Kansas River), and the Downstream Channelized section (Kansas River to the junction with the Mississippi River). Adult sturgeon occupy nearly the full range of available values for each continuous variable assessed: depth, depth slope, depth-averaged velocity, velocity gradient, and Froude number (a dimensionless number relating velocity to depth). However, in the context of habitat available in a reach, sturgeon tend to select some areas over others. Reproductive female shovelnose sturgeon (Scaphirhynchus platorynchus), in particular, were often found in parts of the reach with one or more of the following characteristics: high velocity gradient, high depth slope, low Froude number, and low (though not necessarily the lowest) depth-averaged velocity. Depths used by sturgeon varied considerably. We explored spatial patterns representing the variable ranges that reproductive female shovelnose sturgeon most strongly and consistently selected by mapping areas within reaches meeting the following criteria: greater than the 80th percentile of depth slope, greater than the 80th percentile of velocity gradient, and less than the 20th percentile of Froude number. Our data exploration indicates that areas meeting these criteria have some predictive value regarding sturgeon habitat selection. Of all sturgeon locations that fall on maps from the same year (sample size = 2,013), about 63 percent fall within about 35 percent of the area where at least one variable meets the above criteria and 18 percent of locations fall within 4 percent of the area where all three variables meet the above criteria. The spatial patterns of these mapped areas show distinct differences among the sections of the Lower Missouri River. For example, the areas of predicted selection exhibit a relatively complex mosaic with multiple interconnected pathways in reaches of the Minimally Engineered section. In contrast, areas of predicted selection are concentrated along the channel margins in reaches of the Upstream Channelized section. Because the patterns described in this report represent habitat use in the context of the available habitat in a highly altered river system, selection may not necessarily indicate preferred habitats or habitats sufficient for reproduction and survival of sturgeon species. 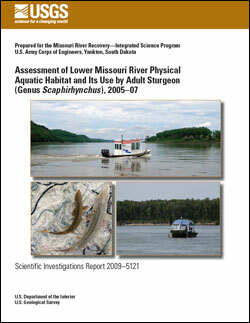 Reuter, J.M., Jacobson, R.B., Elliott, C.M., and DeLonay, A.J., 2009, Assessment of Lower Missouri River physical aquatic habitat and its use by adult sturgeon (genus Scaphirhynchus), 2005–07: U.S. Geological Survey Scientific Investigations Report 2009–5121, 81 p.